THE GINTELS in their backyard. The abandoned Quigg project is behind them. Rudy and Myrna Gintel grieved when their dog Louie died from a rare affliction — fungal meningitis. The Gintels became alarmed when they learned Louie’s death was attributed to exposure to spores, the kind that allegedly thrive in a construction site, like the one next door. A pile of dirt two-stories tall is next door, left over from developer Quigg Builders, Inc., whose responsible officer, Robert Quigg, disappeared the day of sudden bankruptcy filings for his companies on Nov. 30. A Quigg entity previously had purchased the Rimpau Blvd. 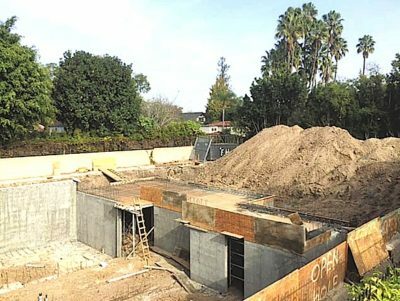 property next to the Gintels, leveled the existing house (a non-historic home in the Hancock Park Historic Preservation Overlay Zone) and excavated a deep hole for subterranean parking and a basement for a two-story, 13,600 square foot project. At the time of the bankruptcy filing, public records show $10,250,000 in loans against the property (although the bankruptcy filing indicates there is $6,840,264 in secured debt against it). In addition to the millions in debt, the beginnings of the garage, some shoring and the high pile of dirt also were left behind. Some days later, Louie suffered from seizures, and $4,500 of vet bills later, the three-year-old boxer died. While he can’t prove it, Rudy Gintel believes the dog was afflicted by the toxic spores from the dirt that was dug up after 70 years and then was left uncovered. ADJOINING THE GINTEL’S PROPERTY, the basement is in the foreground with the large pile of dirt in the rear. Other concerns of the Gintels and other neighbors include standing pools of water from the rain that are accumulating on the 4,500 square-foot concrete basement floor that is not draining. “If the water does not dissipate, it will be a source for mosquito infestation by summer,” said Rudy. The barrier on their side of the home is also unsound and lacks shoring, they say. Rain has eroded the slope of the excavation, he adds. The Gintels’ lot is a precarious five feet higher than the neighboring property. 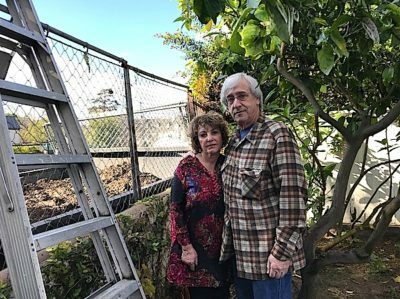 “If that trench erodes, our property would collapse.” To prevent such collapse, “all they have to do is backfill the trench with dirt,” he says. He has yet to learn from the bankruptcy trustee, or anyone else, what is planned to protect his property, Rudy said.